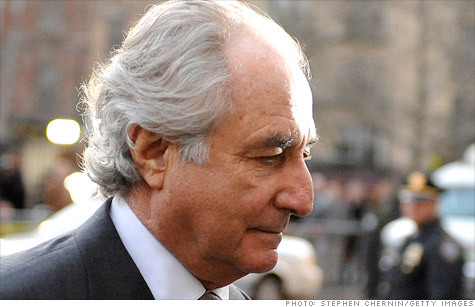 A Federal judge threw out a court-appointed trustee's case involving Ponzi mastermind Bernard Madoff. Picard plans to appeal. NEW YORK (CNNMoney) -- In another blow to the trustee in the Bernard Madoff case, a federal judge threw out a $20 billion lawsuit attempting to recover more of the stolen funds. Court-appointed trustee Irving Picard filed the suit against Italian bank UniCredit S.p.A., Austrian banker Sonja Kohn and others who are accused of participating in Madoff's notorious Ponzi scheme. Judge Jed Rakoff of the U.S. District Court in the Southern District of New York issued a court order against Picard, unraveling his allegations that the defendants could be charged under the Racketeer Influenced and Corrupt Organizations act. The so-called RICO act is generally used against mobsters and other perpetrators of organized crime. Picard alleges that Kohn and her co-defendants, who he sued for $19.6 billion, participated in organized crime. He accuses them of luring European investors to funnel their money into Madoff's New York-based investment firm, allegedly knowing that it was a front for a pyramid-style scam. The trustee dubbed the defendants the Medici Enterprise, an alleged criminal organization that also includes defendants Pioneer Global Asset Management S.p.A. and Alessandro Profumo. But in his court order, Rakoff said that Picard failed to prove that the defendants knew Madoff was stealing the money he fraudulently claimed to invest. The judge said Picard "lacks standing to bring the RICO claims," with their dependence on allegations of wire and mail fraud and securities fraud. But Picard isn't giving up. Spokeswoman Amanda Remus said he and his lawyers "remain confident in his RICO and common law claims" and plan to appeal the judge's dismissal. This is the latest setback for Picard. Last year, Rakoff dismissed most counts in his lawsuit against Saul Katz and Fred Wilpon, owners of the New York Mets baseball team. The trustee accused them of knowingly participating in the Ponzi scheme, which they denied. But Picard has also had some major successes, like a 2010 $7.2 billion settlement with the widow of Jeffry Picower, who is believed to be Madoff's biggest beneficiary. So far, Picard has managed to recover more than $9 million of the estimated $17.3 billion in scammed assets. Madoff used the stolen money to amass multi-million properties in Manhattan, Florida and France, along with jewelry and a yacht. But his scheme fell apart with his arrest on Dec. 11, 2008. He pleaded guilty three months later to 11 federal counts involving a Ponzi scheme and was sentenced to 150 years in prison. Madoff, 73, currently resides at the Butner Federal Correctional Complex, a medium security federal prison in North Carolina. He is scheduled for release in 2139.